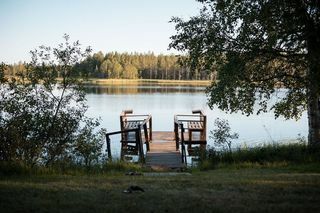 The calmness of the lake and a peaceful environment coupled with the fragrance of birch wood, have a most tranquilizing effect upon people on sauna nights. 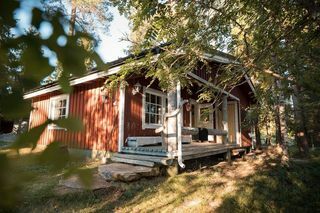 Experience the traditional Lappish sauna in a cozy cottage and take a dip in the private Arctic lake! 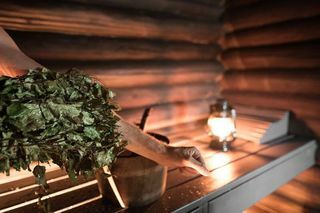 Blow off some steam and enjoy a peaceful night in the authentic Finnish sauna. End the night with a tasty dinner cooked over an open fire. 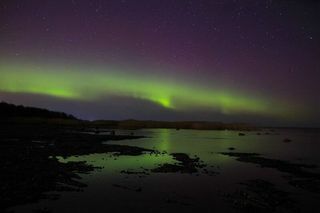 Join us for a quiet night in a wood burned sauna and get ready for the Arctic lake swimming. We specialize in small group experiences as we want everyone to feel comfortable. Surrounded by your group of friends you can relax in a cozy Lapland log cabin. Private local guides will be there to help you have the most authentic Northern experience. 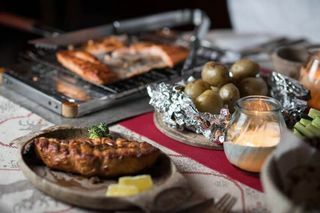 One of the most popular Rovaniemi tours is an evening in Lappish sauna, followed by a delicious dinner. The tour starts with a pick-up from your hotel or apartment and a drive to lovely Langonlampi lake. On a 30-minute ride, we'll tell you about Lapland log cabins and their rejuvenating powers. 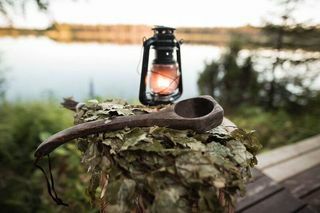 Once we get there we will teach you how to fire up a Finnish sauna and how to make the most of your magical time in the North. Once the sauna is all set up it's your time to relax. Let the heat purify your body as the mellow wintery magic of Lapland purifies your soul. Let go of the stress and enjoy the presence of your loved ones. Here, the Sauna if closely tied to the yearly cycle, and the cycle of life. It is a place for cleansing and tranquility. 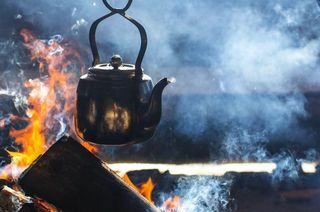 "Löyly" refers to the steam or "hot breath" of the Sauna when water is thrown on the hot stones. While we do our best to prepare you for an evening in the wilderness, it's up to you decide how you want to spend your time. The classic Nordic way is to spend 5-10 minutes in the sauna and then jump into ice cold water, or even a big pile of crystal white snow! Switching back and forth between the hot and cold is a ritual with its own raw appeal. 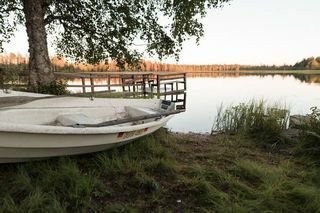 Our sauna is located on the shore of a private lake, swimming to cool off goes hand in hand with sitting in the heat. In wintertime we have a hole in the ice and you can take a dip in the freezing cold water. A cold plunge after a steamy session increases your blood flow, relieves pressure and boosts up your endorphin levels! In the sauna you sit on wooden benches at different heights. The top bench is the hottest and the lowest the coolest due to heat traveling up. The stove is an oven-like heater with a heat-storing pile of rocks on top. Water thrown onto rocks turns into steam and releases a soft heat. In between throwing water onto the stones and sitting in the heat, you pop outside to cool off. Sometimes it's as simple as taking a moment to sit down wrapped in a towel, or other times you make the most of it enjoying good company, conversation and sauna drinks. Sometimes you have a swim. The Sauna is a place for quiet me-time without having to feel lonely. For many it is a place to recharge amid the daily humdrum, where tense muscles relax and the mind calms down. 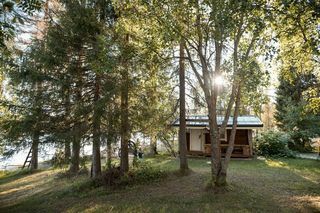 Yet again parallels can be drawn between the sauna and church - it is a calming oasis for cleansing, inside and out. 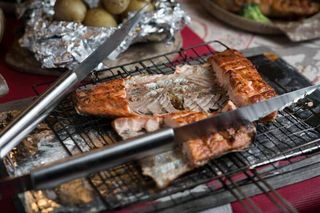 After this unique Finnish Spa experience, it's time to get back to our little wooden cottage to enjoy delicious Finnish dinner - smoked salmon by the fireplace.